Big things are just over the horizon for Gwent, the collectible card game based on the Witcher series that has been playable for two years but is only officially coming out in the coming months. Anyone who has been confused about the long beta, the shifting release dates or the whereabouts of any single player modes has been justified. Today, we can finally clear some things upe. Gwent is being made by CD Projekt Red, the studio behind The Witcher 3 and the highly anticipated upcoming sci-fi RPG, Cyberpunk 2077. It’s been playable in beta, but it got a more official release date today. It is set to launch for real on October 23 on PC (only through GOG, CD Projekt’s competitor to Steam) and December 4 on PS4 and Xbox One. The beta people have been able to play is a significantly fleshed out version of the card game in The Witcher 3. In the big role-playing game, Gwent consists of the player, as Geralt, and a computer-controlled enemy placing cards in rows that simulate a battlefield, each subsequent placement of a card raises a player’s score. Once all the cards are played, the player with the highest score wins. In the version that’s in beta, players have competed with each other in a version of Gwent that has many more cards and involves multiple rows of cards in its virtual battlefield. Although it’s not even out yet, the game has already established itself as one of the most interesting alternatives to Blizzard’s Hearthstone and Bethesda’s The Elder Scrolls: Legends. Thronebreaker will include side-quests and story beats similar to a regular narrative adventure game. Throughout its free beta Gwent has only been playable as a multiplayer card game. When it comes out in full later this year, it’ll include a paid mode called Thronebreaker which is a single player story campaign. Let’s talk about this for a moment. A big part of why The Witcher 3 is on Kotaku’s “Best Games” lists for each console it appears on is a narrative full of interesting themes and complex, charming characters. Thronebreaker is CD Projekt’s attempt to bring those things to Gwent, which is why the studio is quick to point out both are written by many of the same people. Instead of focusing on Geralt and co., Thronebreaker, which CD Projekt says is a 30-hour campaign, focuses on Meve. It takes place just prior to the events of the Witcher video game trilogy. Meve is a warrior queen of two northern realms called Lyria and Rivia which are caught in a war with an imperial power known as the Nilfgaardian Empire. She’s the person who knighted Geralt, which isn’t important to know but still really cool. The single player campaign will include a map that players can actually move around in, rather than just card battles. The campaign is based around card battles and puzzles but will take place on a large overworld map with additional side quests and a resource-gathering system. While not a whole lot else is known about it at the moment, the way it’s been described throughout development makes it sound like a hybrid of the existing card game and the war room stuff from Dragon Age: Inquisition, with animated cutscenes and fully-voiced dialogue stitched in. 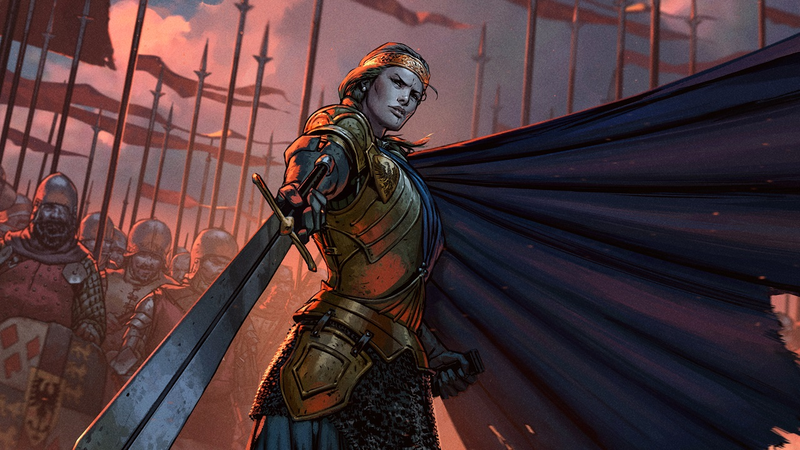 While Gwent itself is free-to-play, Thronebreaker will have a set cost (which hasn’t been revealed yet) and its own, separate sets of cards that won’t carry over to multiplayer. Speaking over multiplayer, it too will be seeing a ton of changes on October 23 (or December 4 for those of us who play on console). An update called Homecoming is getting released alongside Thronebreaker that changes the interface and presentation of the game, according to the most recent development reveal video.. Various card mechanics will also get overhauled, enough so that existing players will have the opportunity to scrap their libraries for crafting materials to begin rebuilding from scratch. Did I mention that CD Projekt is also getting rid of an entire row from the game? Currently, Gwent matches take place on a battlefield consisting of six rows evenly split between two players. When the game actually comes out there will only be four. The way Gwent will look in a month is completely different from how the game has appeared over the last two years. Gwent is going to be a fundamentally different game when it comes out of the beta. Whether you dabbled in this early access period, which has been going on for well over a year now, or haven’t even heard of the game before, the playing field will be a lot more even come October 23 when everyone is forced to adapt to the changes brought by Homecoming. This has been a long time coming. Gwent went into its first closed beta period on October 25, 2016. Back then it played more like the mini-game in The Witcher 3 it was adapted from. Although it was originally supposed to release last December, the extra year it’s spent in limbo won’t have been for naught, since Thronebreaker has apparently doubled in size from original estimates, and, for better or worse, the game has undergone several redesigns to make it look more polished and approachable. Now if only the game would come to Switch and get cross-play.